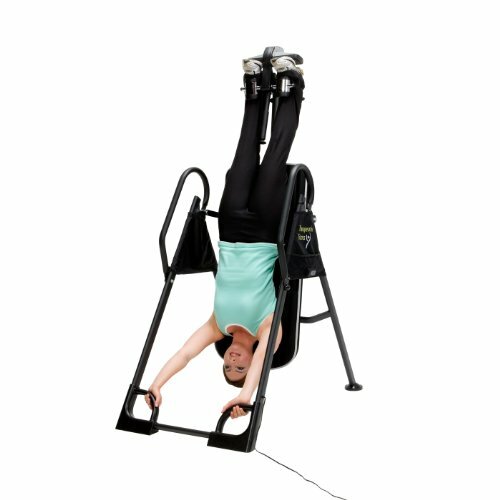 Inversion table therapy is one of the best treatments for all those back pains related to spine and muscle issues. This treatment is steadily gaining a following. After all, around 31 million Americans have suffered from back pain at some point in their lives. Inversion table therapy is a non-surgical procedure where you lie on a table that tilts you upside down. When the body assumes this upside-down position for a few minutes, something amazing happens. Your spine stretches and is decompressed. This also allows your back to relax. Inverting releases the tension that your spine endures from hours of constant standing and sitting. In fact, even when you’re lying down horizontally, your spine still may not be getting the rest it deserves! This is why inversion table therapy is so helpful for the back. Shifting the body weight enables your spine to relax and recover. All in just a few minutes a day! Inversion therapy enthusiasts swear by its benefits. The most obvious is that it alleviates back problems. For many, it’s the ultimate non-surgical solution to chronic back pain. One study even found that nearly 77% of patients who were listed for spine surgery no longer opted for surgeryafter using inversion table therapy. Aside from addressing sciatica, compressive spine, and other back issues, inversion table therapy also does wonders for your posture. It gives you an upright posture, very important in preventing chronic problems to arise. What’s more, this treatment is associated with a balanced immune system. Why? Because inverting boosts blood circulation. When blood circulates properly in your body, oxygen and other nutrients travel more efficiently throughout the organs. Hence, your immune system is strengthened. If you are interested in buying an inversion table, you may have already checked online and seen that there are a lot of options to choose from. How do you decide which one to purchase? Luckily, this article will talk about one of the premier brands on the market today: Ironman. Paradigm Health & Wellness, a US company based in South Carolina, carries the Ironman brand. They offer a line of inversion tables that each have distinct properties. What these tables do have in common is the quality construction that the brand is known for. Inversion tables need to be sturdy and durable because they rotate and carry your whole weight. With Ironman inversion tables, you can experience comfort and stability during your inversion sessions. 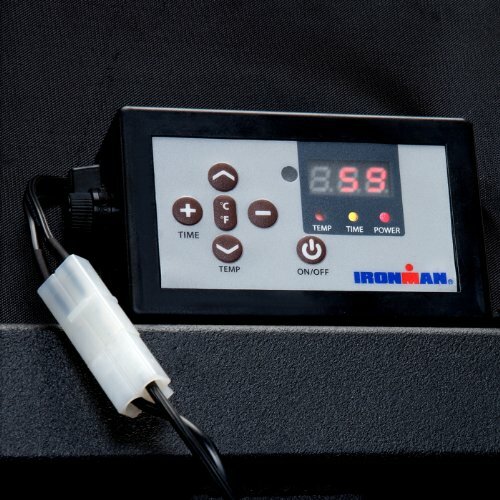 The latest offering from Ironman is the Ironman IFT 4000 Infrared Inversion Table. This model is an upgrade to the IFT 1000 and showcases innovative design that combines an inversion table with infrared heat features. As with the Ironman Gravity collection models, the IFT 4000 enables users to choose from three different starting positions. You can choose the degree of inversion that your fitness level or need requires. The Ironman IFT 4000 is constructed with steel frame tubes coated in a powder finish for a smooth and scratch-resistant surface. Extra-long safety handles provide a sturdy grip, enabling you to move and return to upright position with ease. There are also inverting handgrips to help you stay stable while in the inverted position. 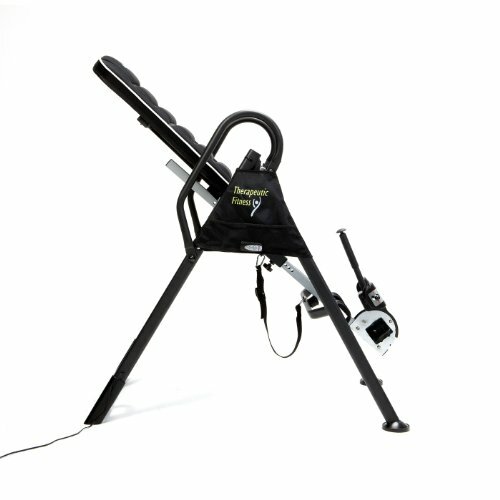 A quick-release ratchet-gear system is built into this equipment, as well as an adjustable safety tether strap. This patented mechanism provides a safe and easy-to-reach locking system so that you always feel secure while you invert. Meanwhile, for the ankles, there are molded ankle holders that are ergonomically designed to provide both comfort and security. The table can rotate a full 180 degrees, during which you can grip the handles built into the base to allow your spine and back muscles to be stretched. The backrest can be adjusted to support heights of up to 6’6”, and the device can handle weights of up to 350 lbs, very useful when getting the weight distribution right during inversion. The IFT 4000 has dimensions of 49 inches (length) x 26 inches (width) x 65 inches (height). It weighs 75 lbs. 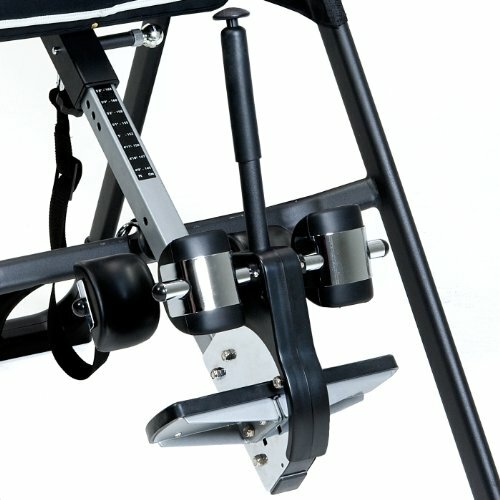 The Ironman IFT 4000 inversion table has this innovative feature: the backrest has built-in Carbon Fiber F.I.R. (Far Infrared Rays), a heating element that penetrates deep into your back without the burning discomfort you’d experience from other heating treatments. Because heat is known to alleviate pain in the muscles, F.I.R. heat is fantastic for injuries, chronic conditions, and muscle strains. Heat also increases blood circulation, further aiding in body recovery and relaxation. What’s so great about F.I.R. heat is that it does not pose any risks for electromagnetic exposure. Aside from that, it’s much more effective compared to heating pads, hot towels, and pain relief creams. The Ironman IFT 4000 combines two powerful treatments into a single piece of equipment. As an inversion table it relieves compression of your spinal discs and ligaments, and at the same time its F.I.R. heat technology soothes and heals your muscles. The IFT 4000 has a maximum setting of 140°F. The reading is shown on the LED display control. The heating technology takes only around 15-20 minutes to warm up. You should set the temperature before securing yourself on the table. Use the main controller panel before locking on the ankle holders, so that you can feel if the temperature is just right. The main controller panel lets you set the temperature using Celsius or Fahrenheit. This device is completely customizable to fit your preferences. The IFT 4000 can be assembled using the tools and instruction manual included in the package. It usually takes an hour to assemble the parts together. The device can be folded and stored conveniently when not in use. This model has a 1-year limited warranty. Which we find a little short; however with the sturdy construction and well-known name brand this inversion table will last a long time. Both models feature the Carbon Fiber infrared heat therapy backrest and maximum temperature of 140°F. Also, both inversion tables can reach an angle of 180 degrees and are foldable for storage. There are a couple of premium features that make the IFT 4000 more expensive than the previous model. One is its thicker backrest that is 2.5 inches thick compared to IFT 1000’s 1-inch backrest. The ankle lock gear on the IFT 4000 is also upgraded with a palm-activated ratchet system, different from the simpler spring-loaded system of the older model. Plus, the newer IFT 4000 can support weights of up to 350 lbs, a lot more than the 275 lbs maximum that the IFT 1000 can handle. Both models offer a secure and comfortable inversion experience, with the IFT 4000 having a 2.5-inch cushion and the Gravity 4000 having a memory foam cushion to support the back. The palm-activated ratchet is also built into both inversion tables, and each can support a maximum weight of 350 lbs and heights of up to 6’6”. Of course, the difference lies in the heat technology. The IFT 4000 can simultaneously soothe the muscles with its infrared heat tech, which is not found in the Gravity 4000 model. For roughly the same price, the IFT 4000 gives another dimension to traditional inversion table therapy by having the heater built into the backrest. 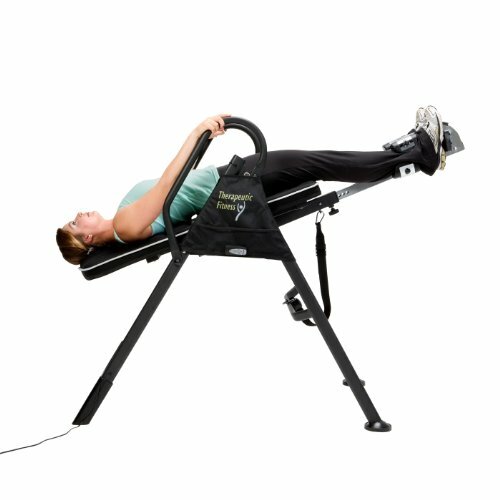 Another popular model is the Ironman ATIS 4000 (read our review here), which enables users to perform targeted abdominal exercises on the inversion table. It has 10 different locking angles that allow the user to do crunches and ab workouts while inverting. The main difference between these two is the added feature. The ATIS 4000 is for those who want to incorporate ab workouts into their inversion routine. On the other hand, the IFT 4000 is for users who want to double the rehabilitative benefits by adding heat therapy into their inversion. Moreover, the IFT 4000 edges out the ATIS 4000 in terms of storage because it is foldable, while the ATIS 4000 is not. Sturdy build creates a strong and stable frame. Thick cushion provides comfort during the treatment. Infrared heat technology helps soothe back problems such as fibromyalgia. Easy-to-use remote control for temperature and angle adjustment. Safety strap allows secure custom inversion angles according to comfort level. 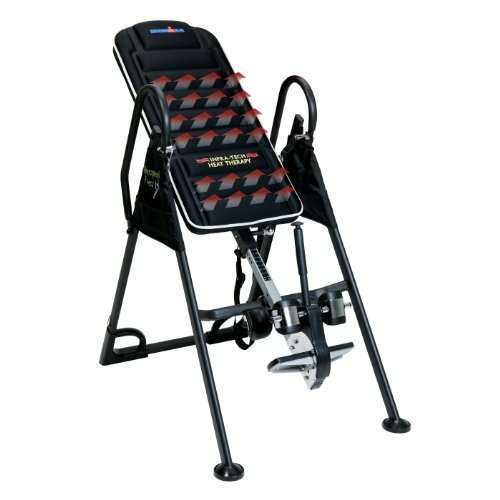 More expensive than other inversion table models. Doesn’t lock at different angles, so this cannot be used for inverted abdominal exercises. Some customers have reported discomfort with the ankle holders, but wearing thicker socks would resolve this issue. LED display is only seen on the back support and not on the remote, making it hard to see when adjusting the temperature. The Ironman IFT 4000 is a versatile and durable inversion table that offers a full 180-degree inversion angle, comfortable cushioning and, of course, the health benefits that heat therapy can bring. If you’re looking for equipment that will boost your circulation and eliminate your stress and fatigue, then this inversion table is perfect for you.